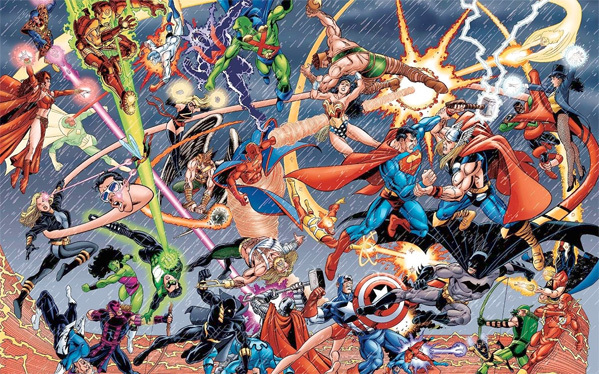 While Marvel Studios has done an incredible job building their own cinematic universe, and DC Comics is in the midst of doing the same thing at Warner Bros., it's pretty much a guarantee that we'll never see the comic book giants go head-to-head on the big screen in the same movie, even though they've done so in the comic books. But one fan, Alex Luthor, has decided to mash-up both of the comic book worlds into an epic trailer (via Toybox). With some clever editing, this is one fantastic, epic trailer that now makes me want the impossible. Iron Man fighting Batman, Wonder Woman fighting Hulk, and much more. Watch below! You'll notice that footage doesn't just use the Marvel and DC movies, but also some TV shows like "Arrow" and "The Flash," even the unaired "Wonder Woman" pilot starring Adrianne Palicki, and they're used really well. Having Hawkeye fight Green Arrow is a particularly nice tough, not to mention Thor fighting Superman and Green Lantern fighting Captain America. At the end of the day, this is just plain fun. Honestly, I don't think there's any way to ever pull off a film like this narratively, let alone get everyone to cooperate on a mash-up like this. But still, it's nice to have someone give us a taste of the impossible dream. Haha that was pretty well done. I love the bits of Deadpool thrown in the, especially when they had him blow up from Deathstroke. This would be interesting to see on the big screen, but I'm not holding my breathe for it. Haha...cool, but we at least 20 years out from this happening. SPOILER ALERT: Movie ends with everyone dead except for Howard The Duck and Bat-Mite. They marry and settle down and adopt Stan Lee at the end. In an after credits sequence Marvel Zombies and Blackest Night heroes devour the known universe. This is very cool! Haha...Did I see Tarzan for a second? Really, U call this epic?.. Why is there always some flashes about that cr..movie Guardians of the galaxy. man that really sucked just like the one called Dawn of the planet apes..really..